I saw some kidneys at my usual pork shop ( Leong Sin Nam Farm ) in Jalan Leong Sin Nam ( see even the street is named after this great man ) and bought 2 pairs back . I love to buy my meat from this place for the meat are kept in their chiller and the meat are fresh from their farm :) My grandmother used to cook this for me when I was young. 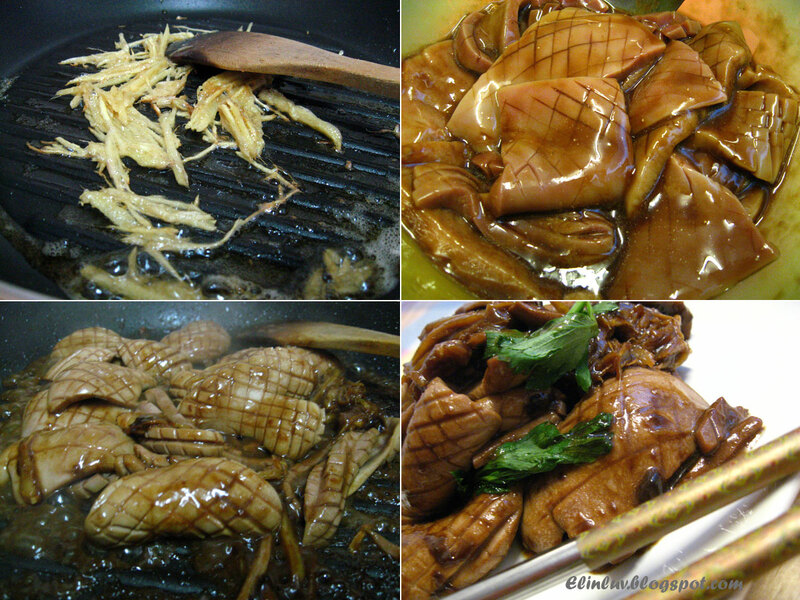 I love the ginger strips fried till crispy in sesame oil...wooow I tell you I love the beautiful smell of sesame oil with ginger...so fragrant that I can eat this everyday and not get bored :0 The magic in this dish is the sesame oil and ginger ! Of course don't eat this often...high in cholesterol . Moderation is my motto in life, where food is concern that is LOL! 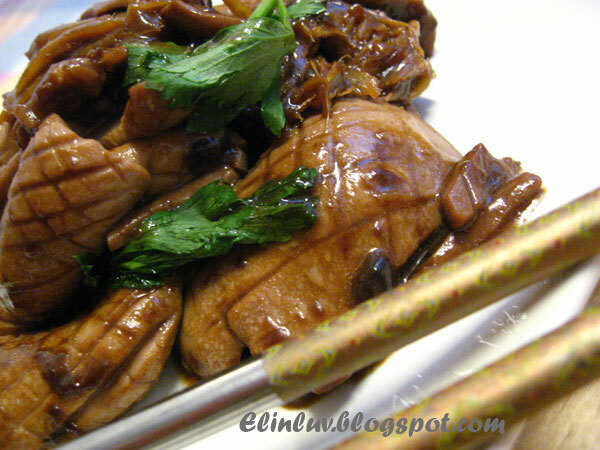 Marinate the pieces of kidneys with oyster sauce, sugar , corn flour and pepper for 1/2 hour. Heat up a wok with sesame oil . Add in the ginger strips and saute till fragrant. 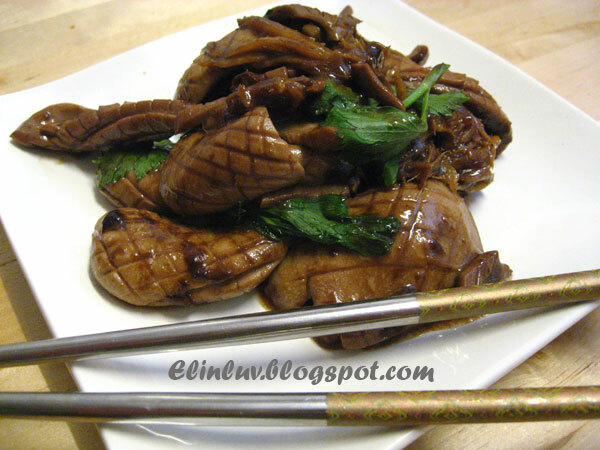 Add in the marinated kidneys and stir fry for 5 minutes , add in the water and slowly braised till cooked . Add in the wine and coriander leaves and dish up. Serve with a bowl of hot rice. 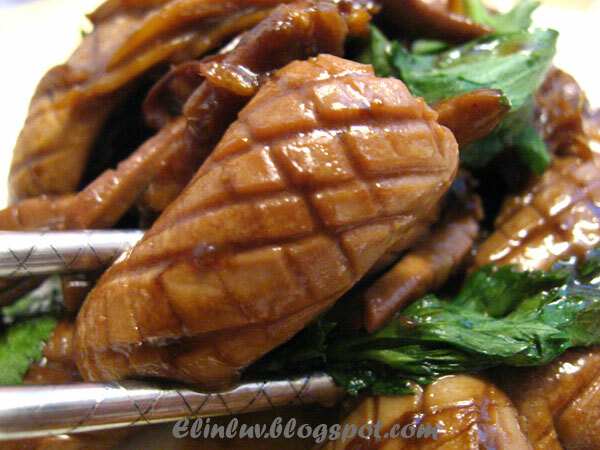 Many other parts of pork can be cook in this way too, and it's yummy! interesting but both hubi and me doesnt like kidney. Hubi love gizard while i love the heart. I remembered my mom stir fried gizzard with cucumber . taste very nice. Oooo...drool! Not into kidneys. Maybe can cook liver using the same recipe. Hey, Elin..... Are you on confinement?? Looks so mouth watering and fragrant with simple ingredients. my mom cook this for me during my confinement last time, I love it. but I never cook it at home, due to only I appreciate this, hehehe..
Used to eat the kidneys stir-fried with tomatoes and ginger...but that's when I was young...now I hardly touch any of them. You make the most incredible dishes. Your pictures really bring them to life. I need to have you give me some photography lessons! Elin, the only kidney I've even taken was the vegetarian one! haha... I never take this during my confinement period either. Thanks for sharing. Enjoy your evening. wah...chu yew ah.. hmmmm... reminds me of my confinement.. I am so glad to see organ meat here. Too many people thumb their noses at organ meat. 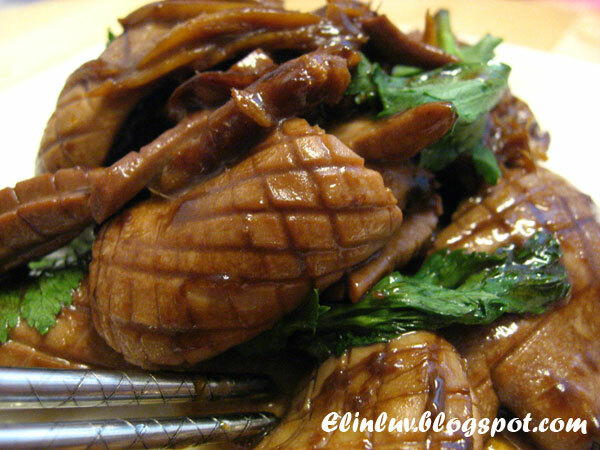 Wonderful recipe for the kidneys. oh man, I wish I can ocok this! My hubs would ewwwww me!